Hey everyone! How's it going? The week has started off pretty darn busy here for me. I have Cocoa & Hearts paintings that I need to launch this month as well as a few commissions I've been working on...& of course there's MadeByGirl. So, along with all the colorful outfits you're seeing while shopping, now you can have glasses to match if you choose to! I love wearing shades. But, I'm really in need of some new ones, mine are slowly falling apart! Not so sure if I would dare jump on this trend, but then again...I have a tendency to jump on trends after the fact. But, if I had to choose a color & style, I'd go for number 1, Marc Jacobs aviators in hot pink. Would you wear colored sunglasses? Which of these would you love to take home with you? very cute, but i definitely won't be able to pull this trend off. my FAVORITE are my classic ray ban aviators. there is NOT a better style out there in my opinion! I love the look of colored frames for a change. I`d wear 1,2,6 & alex`s for sure. I dig colorful specs. I love love love my red wayfarers. I love love number two. Some great color...but not too neon. Aviators are tops, for sure! I love my ray-bans. However, if I had to pick a color, the #5 marc jacobs are my favorite! 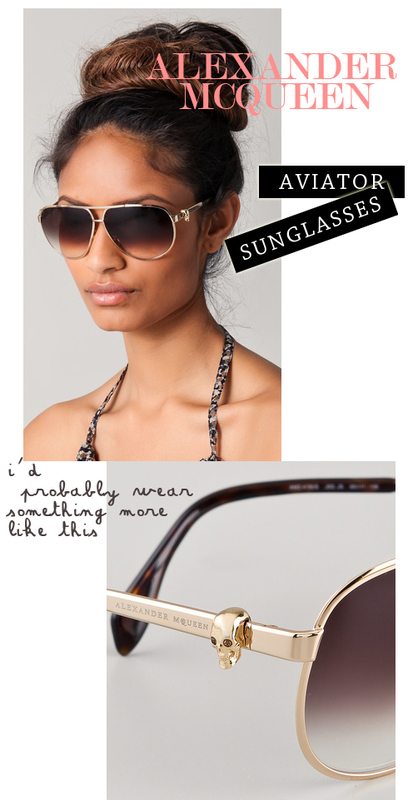 Love the McQueen aviators though; classic! You can't go wrong with aviators! I love my Ray-Bans... so I would pick the McQueen aviators for sure. The #5 Marc Jacobs blue sunglasses are cute, though! Jen--I am so sorry! I think I usually send my comment through twice because I think it hasn't gone through; I apologize if that happened again today! So sorry! Ooh...I quite like the shape of #3. I do like the colored frames--i don't know if I could pull it off--but I would probably start with the "pretty blue via matthew williamson". I wrote a blog about sunglasses today too! I can't ever figure out which ones I want. I would wear number TWO! love that color. goodness! But LOVE the Alexander McQueen option! Oh boy I would go for # 1 if I had to choose color but #7 is my fav. for me it's, #4 the bright pink MW glasses. I'm totally diggin colored glasses!! VICTORY PAPER DESIGNS: interesting, i would have never thought of something like that! thank you for the info...something to consider. agreed! alexander mcqueen's for sure! Alexander MQueen all the way!!!!!! The color trend isn't for me but, I will partake in the Alexander McQueen Avaitors! I love the bright colours of these sunnies! My favourite type are cat eyed sunglasses! Very cute, but so not my style unfortunately. my favourite at my vintage cut Ray Ban Wayfarers and my aviators. Love them, love them, love them. Fun! I have a pair of green ones that I always feel are fun to wear. And a little more casual too, in a way. Love those McQueen shades. I'm with you. I like the trend on other people, but my gold aviators or tortoise shell wayfarers are timeless. Sunglasses tinted to protect the eyes from sunlight or glare. It is provide varying levels of protection from the harmful effects of the sun.